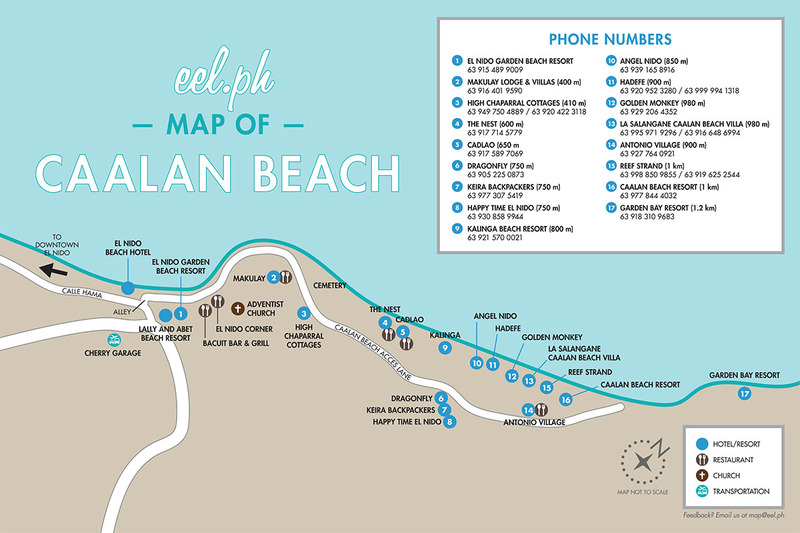 We created a map of all the resorts on Caalan Beach and will be posting this on signs along the Caalan Beach Access Lane! You can download the printable pdf here! 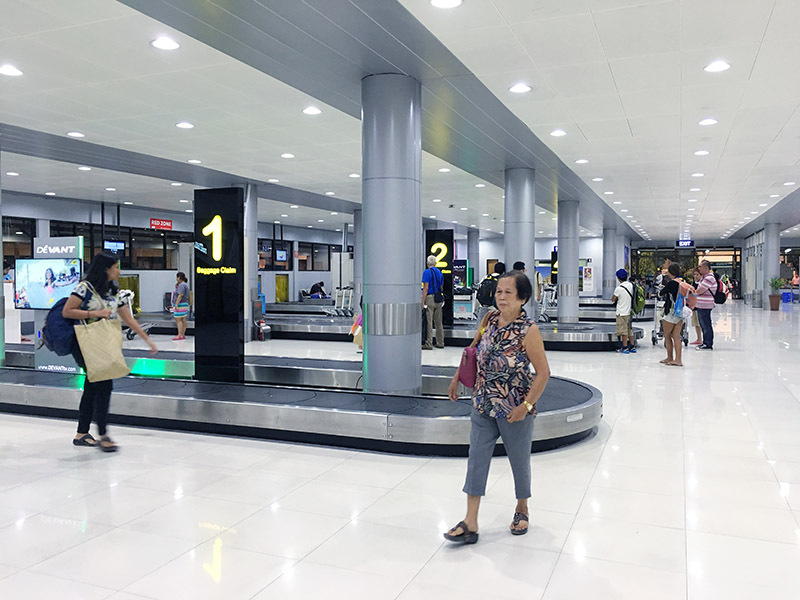 Air Swift moved into the Manila Ninoy Aquino Airport’s Domestic Terminal 4 in March 2016. 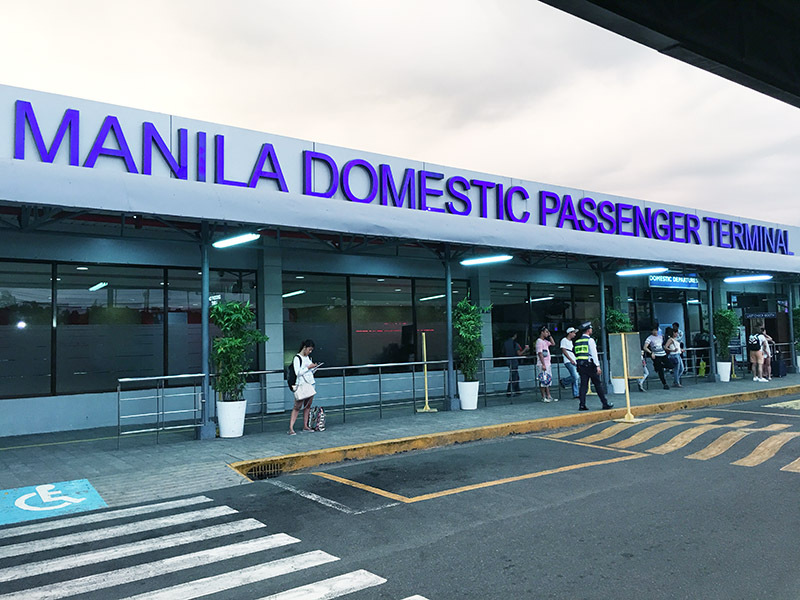 I have to say that I miss their (nicer) old private terminal that I’ve been flying in and out of for the past 11 years, but it is much more convenient now that their terminal is located inside the main airport. I’ve been in Air Swift’s new terminal six times since they moved, and have lots of tips to share! 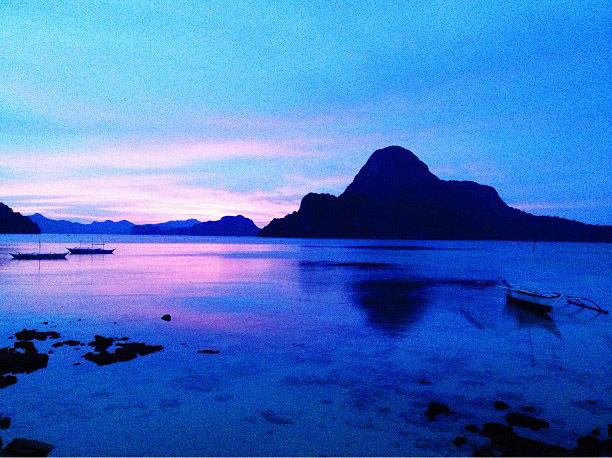 The fastest and most convenient way to get from Manila to El Nido is by taking Air Swift, (formerly known as ITI). 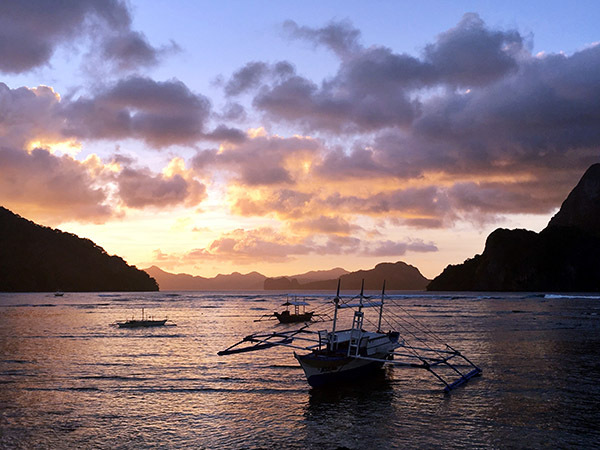 Flights are 55 minutes on a 50 seat plane and depart daily from Manila and El Nido. The schedule varies depending on peak/off-peak seasons (typically 3-4 flights/day) so please check their website for the most current information. 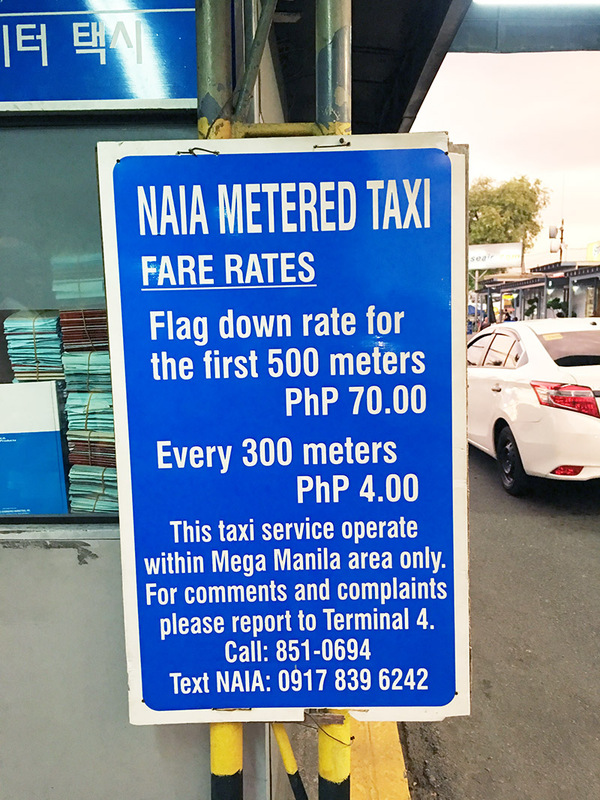 Flight rates range from around 4000 pesos – 6500 pesos one way. You can book tickets directly through the Air Swift website. Please note that there is a strict 10kg (22 lbs) baggage allowance for checked in luggage, not including carry-ons. There is an excess luggage charge of 200 pesos per kg you are over. You can, however, purchase 10kg extra luggage allowance for 200 pesos — most people are not aware of this (we weren’t for years and constantly paid overage charges!). This is not an option when you book your ticket online, so you must email Air Swift in order to get the extra luggage allowance added to your ticket. We would highly advise you to take advantage of this option as it is affordable, 10kg luggage allowance is easy to go over, and the overage charges are very high! Your carry-on luggage is not weighed, but please note that standard carry-on sized luggage exceeds their size allowance. If your carry-on bag is larger than they allow, you will have to check it in and it will count towards your 10kg checked in luggage allowance. So take smaller bags on the plane such as backpacks, tote bags, and shopping bags ( I take all 3!). it takes less time than a taxi because it cuts across the middle of the airport (where taxis do not have access). We would suggest that you allow at least 3 hours between connecting flights. 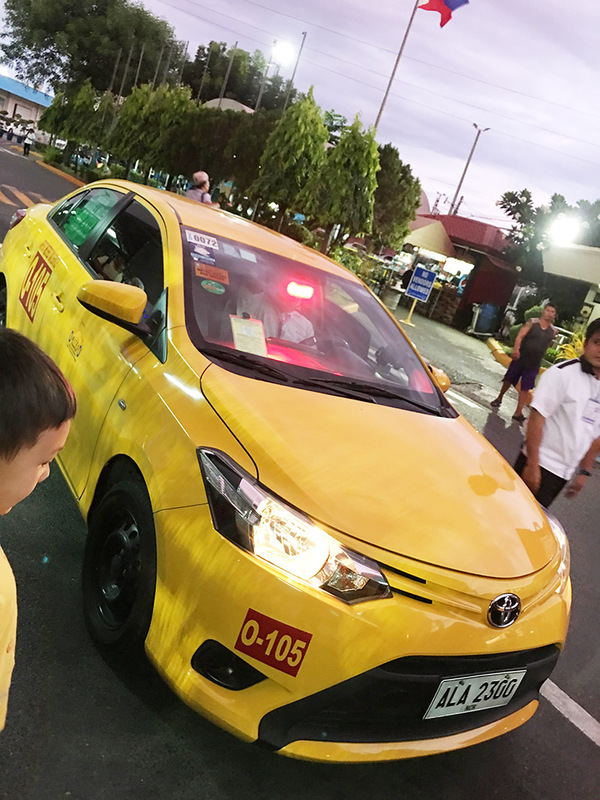 If you will be spending the night in Manila, get into the metered taxi lane in front of Terminal 4 which has yellow taxis. These are regulated by the airport. If a driver shows you a rate card instead of turning on their meter, hop out right away. This is completely illegal, though still commonplace, and fares will often be 5-10x much as they should be. 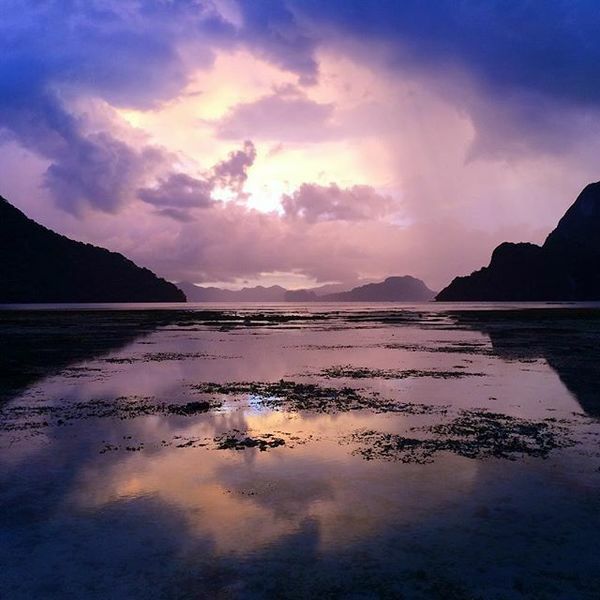 I was organizing some of my pictures recently, and came across some I took in El Nido 11 years ago. 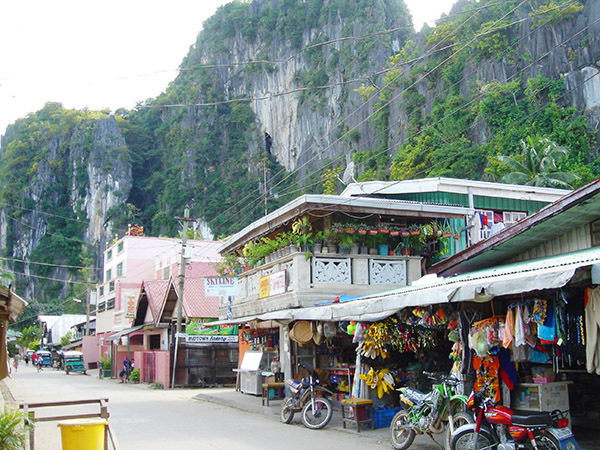 Back then it was a sleepy little town and I don’t think there were even any island hopping tours. 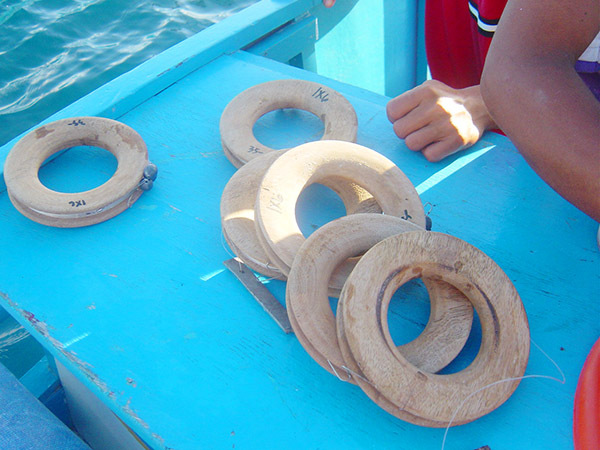 There were bangkas, but they were much smaller and typically used for fishing. 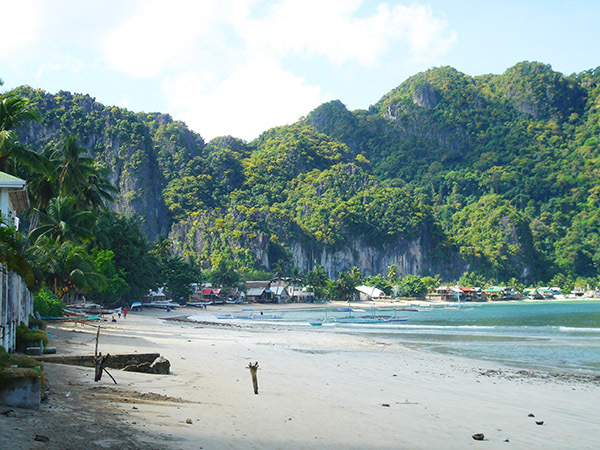 This is what Bacuit Bay looked like in 2005! 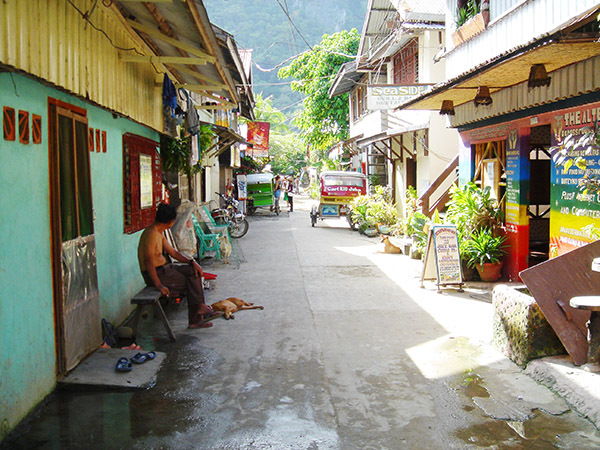 Rizal Street. Skyline Restaurant and Midtown Bakery are still there in the same spots today! 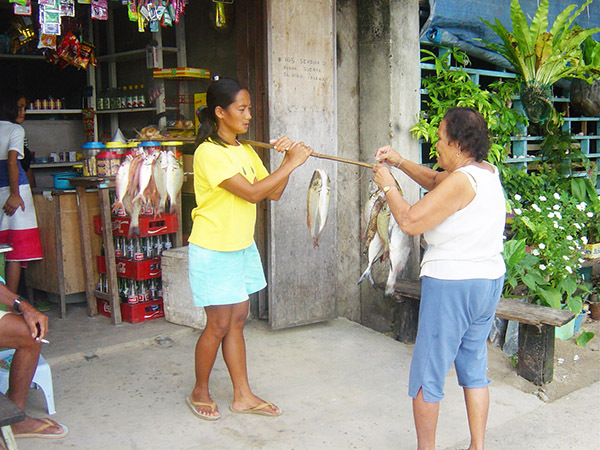 There were a lot more locals that sold fish door to door. There used to be a small elementary school downtown, much closer to the beach than it is now. And they had the cutest uniforms. 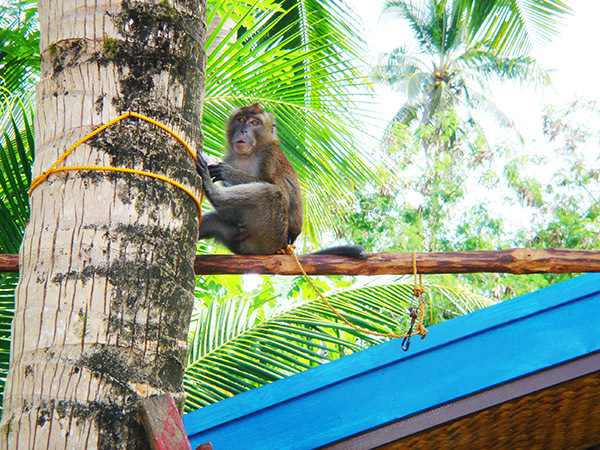 There used to be a lot of monkeys along Caalan Beach. 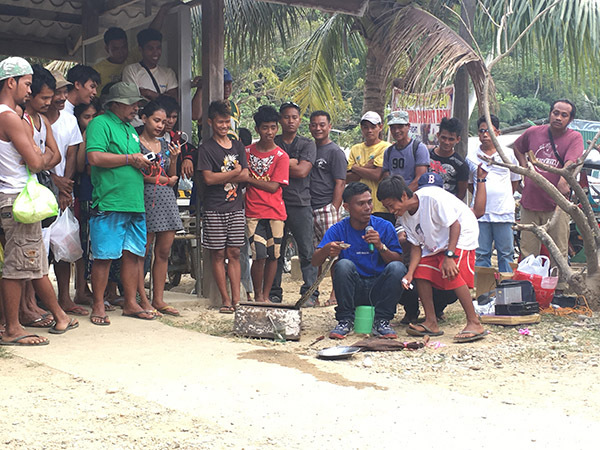 This was taken in front of what is now Makulay Beach Bar. There also used to be a lot of turkeys. Some things haven’t changed. 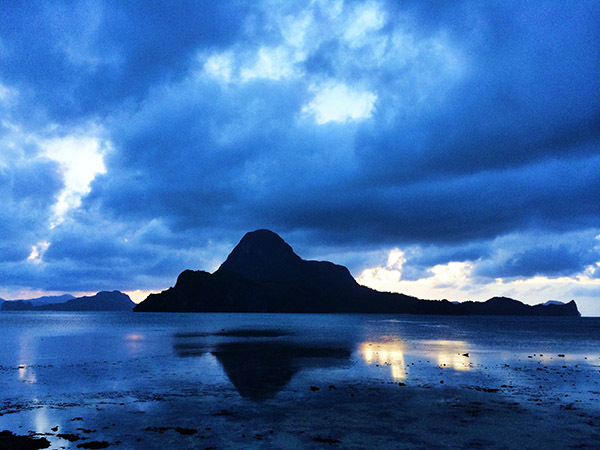 Snake Island is still just as beautiful! We went fishing earlier this week using similar reels, and caught the same type of fish! 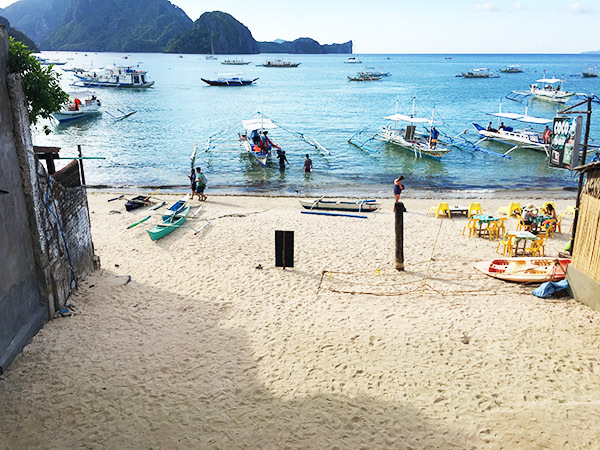 We just wrote a directory of businesses in El Nido! 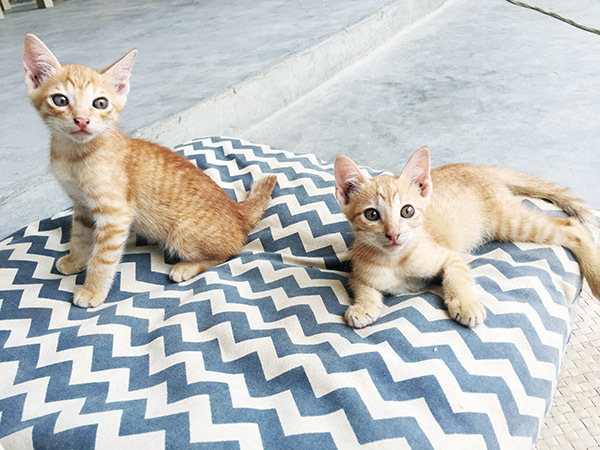 Please check it out here! 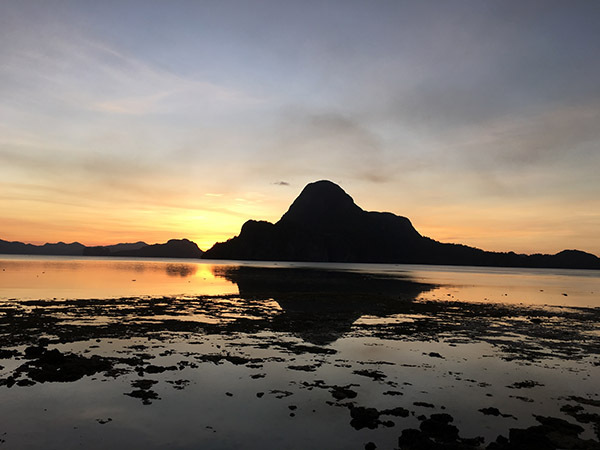 This post was originally published on May 7, 2016, but there have been many changes to the El Nido food scene so I thought I would update this post! 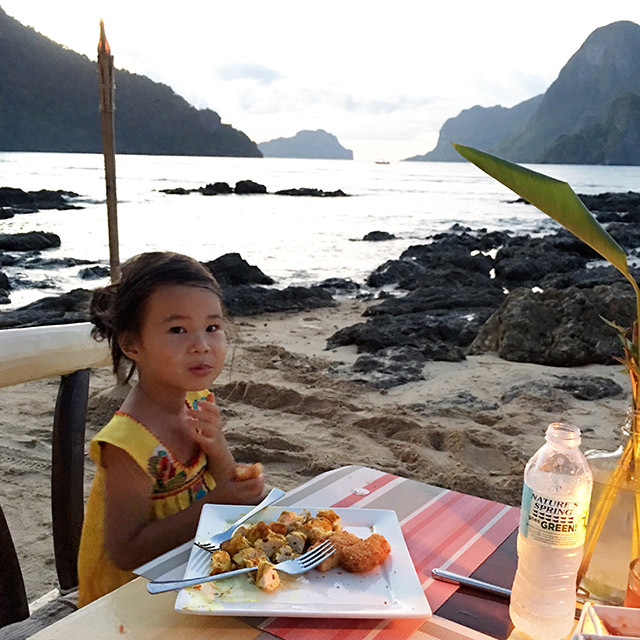 I’ve been to almost all the top restaurants in El Nido, and these are the dishes I recommend! 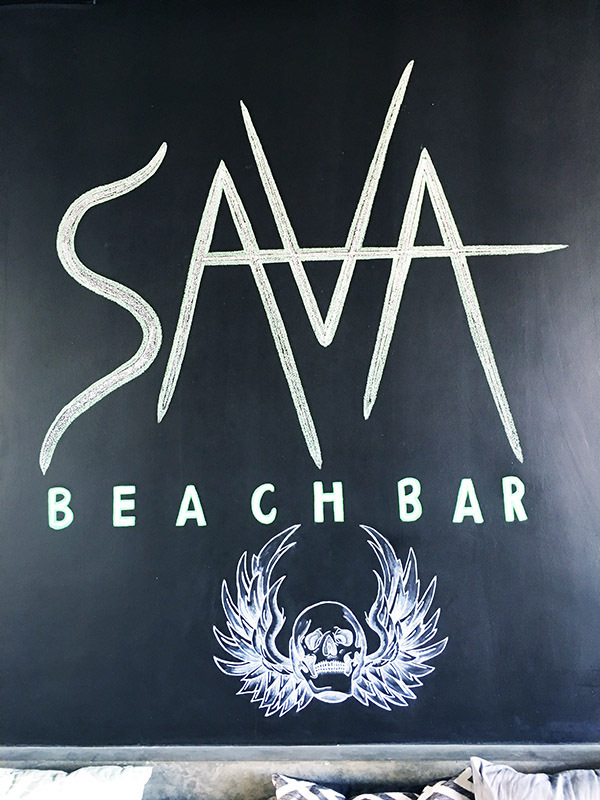 I’d been eagerly anticipating the opening of Sava Beach Bar, as I could see that it was going to be the first high end bar in El Nido during construction. It’s located beachfront on the main street in town (across from Squidos), and just opened last week. Having been there several times already and sampled most of the cocktail menu, I can safely say that they have the best cocktails in town! The bar opens right out to the beach on their own private lot of sand (looks like they’ll be putting something there in the coming months). 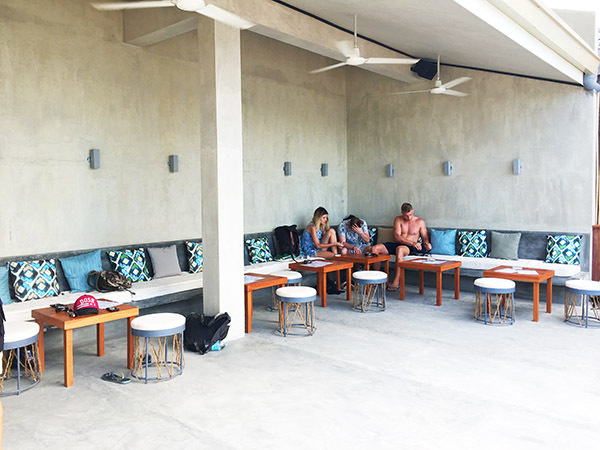 The high speed ceiling fans and ocean breeze do a great job of keeping you cool. There is seating and a spacious open floor plan on the second floor. With this view and stairs that lead right down to the beach. They are pretty much the only bar in town with original cocktails, and I like that they serve premium liquor cocktails as well. 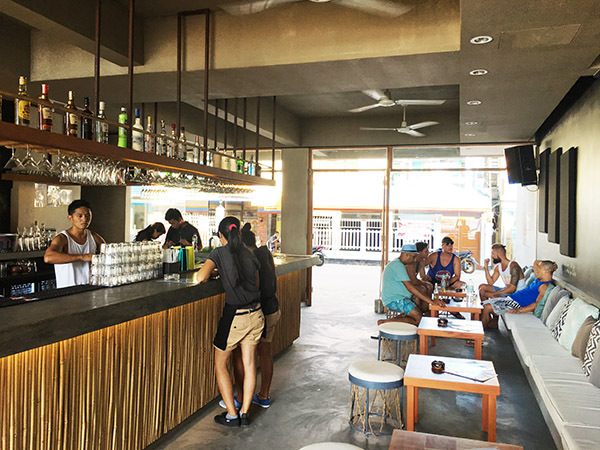 Elsewhere in El Nido you will see the same margaritas, mango/banana daiquiris, mojitos, and pina coladas, so this is a refreshing change to the El Nido bar scene! 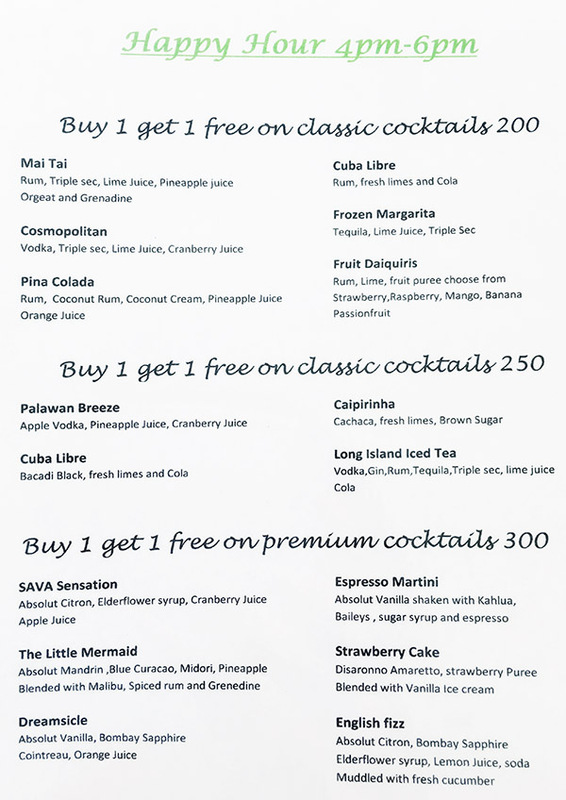 I’ve tried most of the cocktails, and you can’t go wrong with the daiquiris. But the most delicious thing on the menu is hands down the Strawberry Cake! 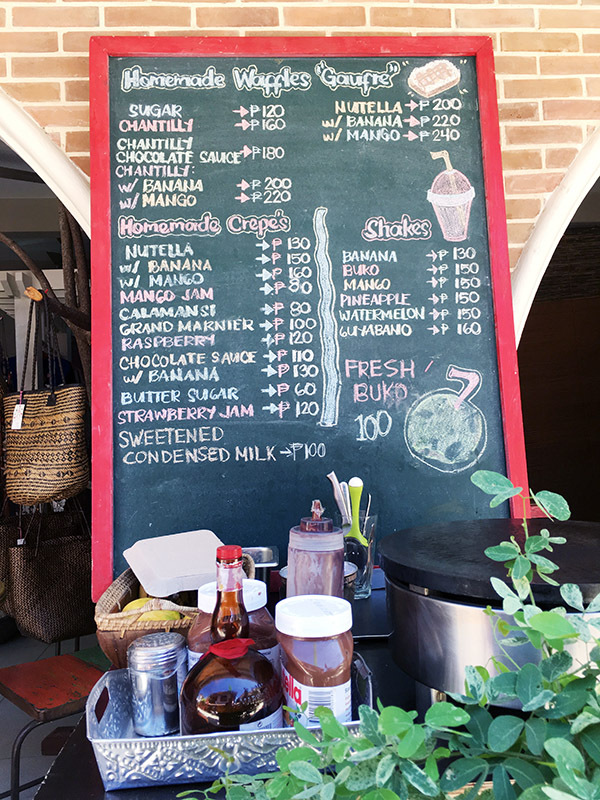 My kids miss strawberries most of all since they’re not available in El Nido, so they loved their virgin strawberry daiquiris. Sava doesn’t yet serve food though they do provide complimentary nuts, but you can grab a delicious hot dog next door at the Bald Guy Grill like we did. This is probably going to become my weekly hangout! From October-March, I love catching the sunset at one of my favorite beachfront bars, La Plage, in Corong Corong. 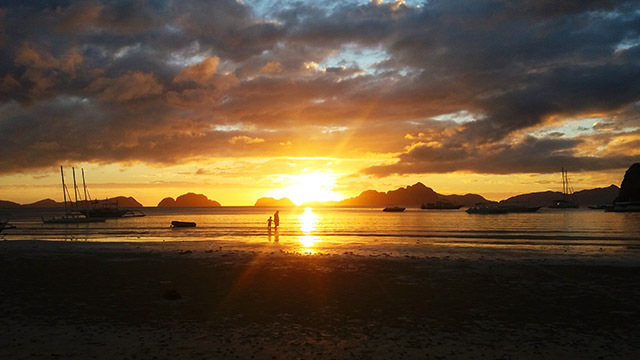 But the sunset starts shifting in April, setting over Matinloc Island, and by May it sets at Caalan Beach. Here are some pictures of the sunset I took in front of the resort last night (May 5th)! It gets better and better with each passing month, with skies that can be orange, red, pink, purple, or blue. Here are some more sunsets in front of our resort in July/August from years past! For reference, here is a sunset in Corong Corong in November. And a sunset in February. 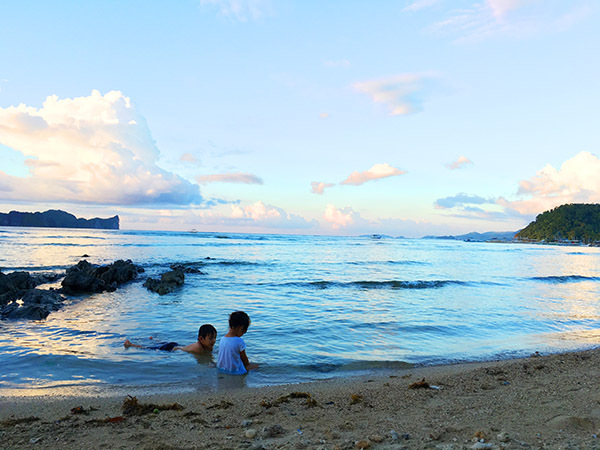 Before we moved to El Nido, we brought our kids to visit every summer from the time my daughter was 9 months old and my son was 2 1/2 years old. 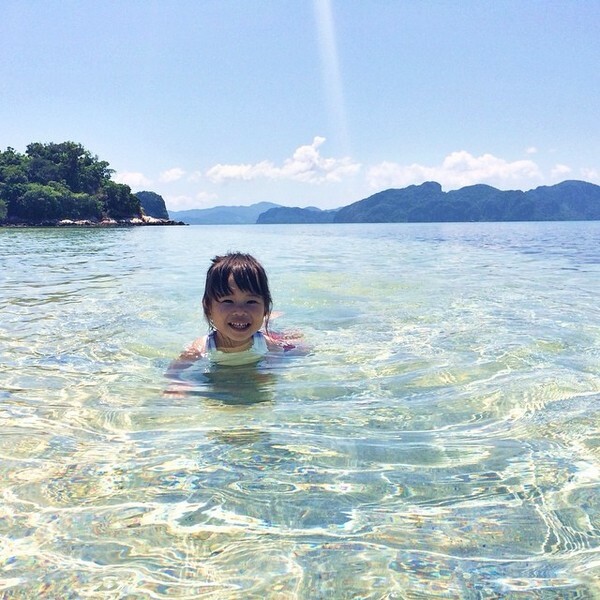 There really isn’t much for a 9 month old to do, so I mostly stayed on the resort with her while my husband took our older son island hopping. But the following year when my daughter was 1 1/2 and walking, she had the time of her life. 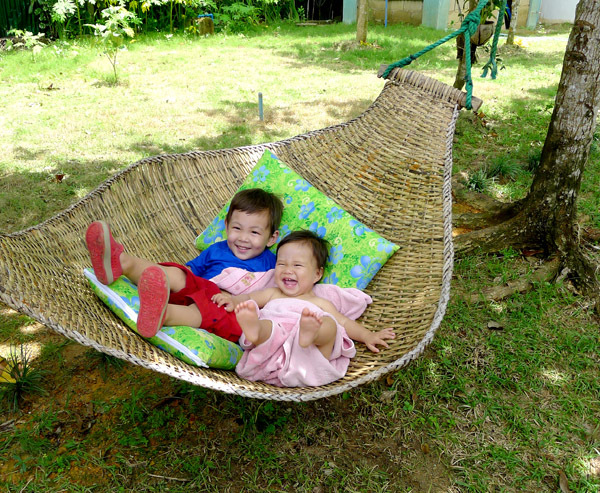 I firmly believe in the benefits of travel with young children, even when they’re too young to remember the trip! 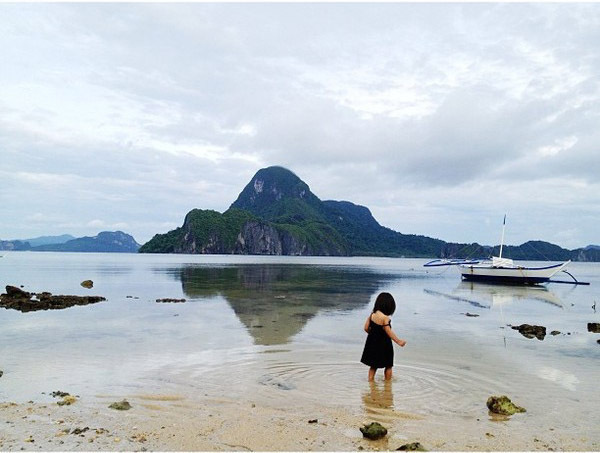 So what is there to do in El Nido for kids? Tour D is definitely the most family friendly, as it is the closest tour. My kids have gotten seasick on Tour C, which is much farther out (I always have children’s Dramamine with me and give it to them before car and boat rides). 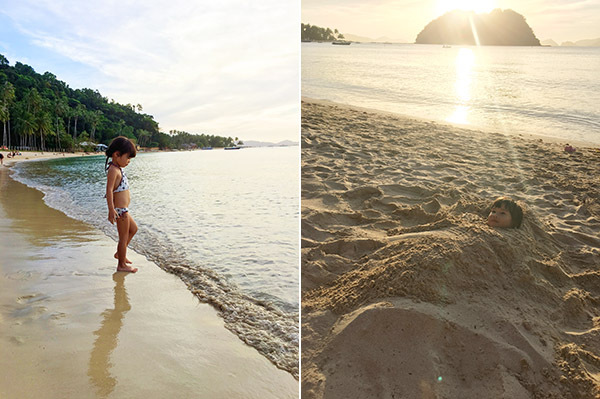 Tour D’s stops are all beaches without coral, so they are ideal for young children. 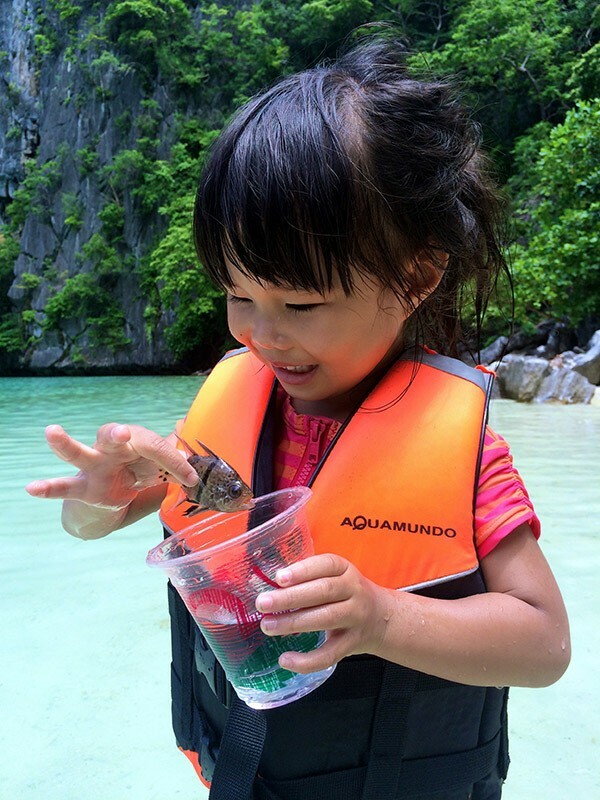 We still go island hopping at least once or twice a month, and it is almost always Tour D.
Tour B is a good option as well, although the caves are not the most young kid friendly, but Snake Island is loved by children and adults alike. 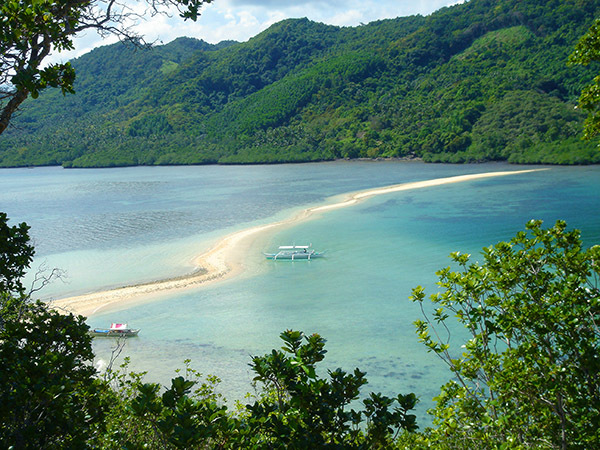 It has a stunning view and shallow crystal clear waters for swimming. I definitely would not recommend Tour C as swimming and walking through choppy waters are required for some of the stops. And Tour A is not ideal because you need to kayak to properly explore Small and Big Lagoon. 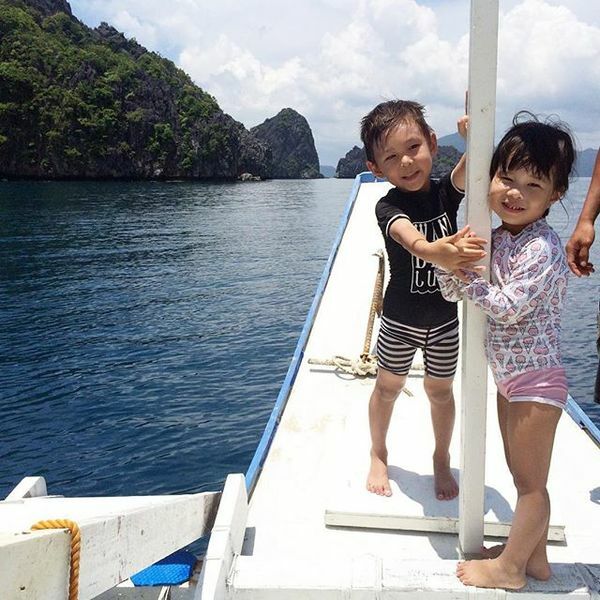 The best way to get the most out of the island hopping experience with young kids would be to do a private tour so you can pick the best destinations. 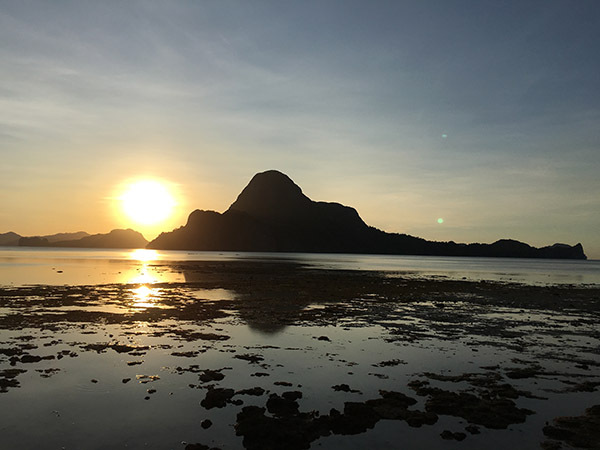 I would probably go to Snake Island (Tour B), and then some of the closer beaches like Simizu (Tour A), Helicopter Island (Tour C), and Cadlao Lagoon (Tour D). Definitely a maximum of 5 stops — any more and you’ll feel rushed. Nacpan Beach is just a beach, but it has such great water and powder soft sand that we always spend the entire day there when we visit. 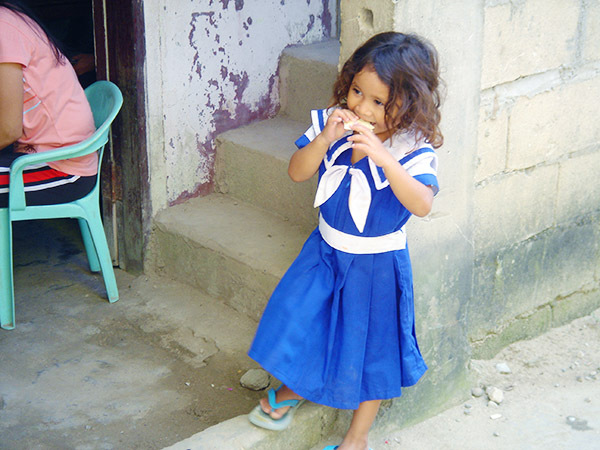 The 1 hour tricycle ride can be quite uncomfortable for young children, so I would recommend hiring a private van for 3000 pesos for the entire day (a tricycle costs 1500 pesos). 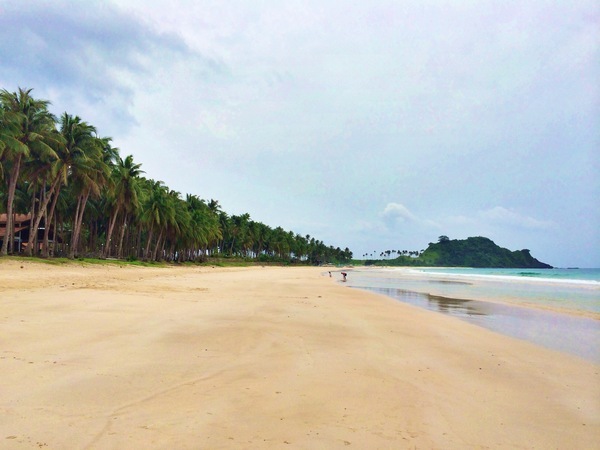 This is our favorite beach in El Nido. 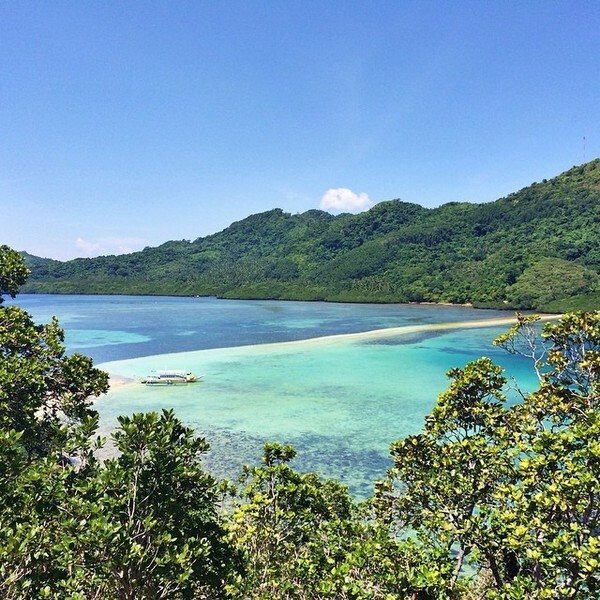 Caalan Beach isn’t great for swimming because there is a lot of coral, but it is great for exploring! 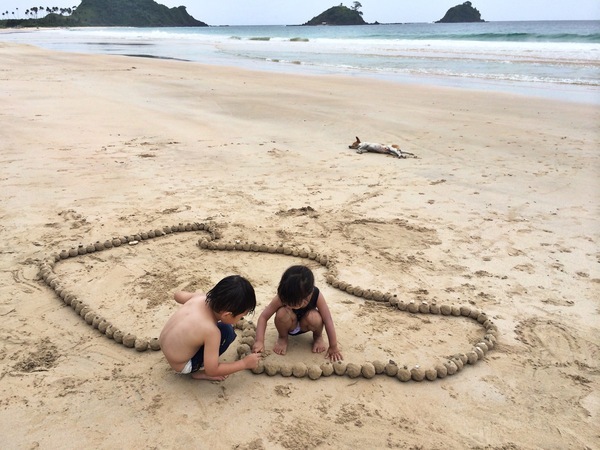 My kids could explore the coral during low tide for hours. 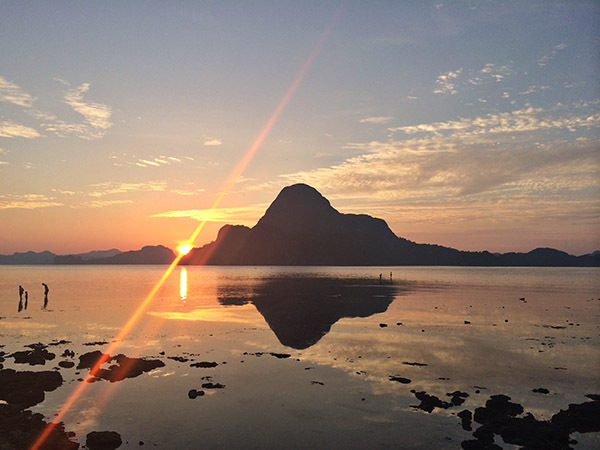 The best times of day are early in the morning or before sunset when the strong sun isn’t overhead. We’ve seen everything from sting rays to starfish, and a sea turtle (that unfortunately had died) even washed ashore last month. 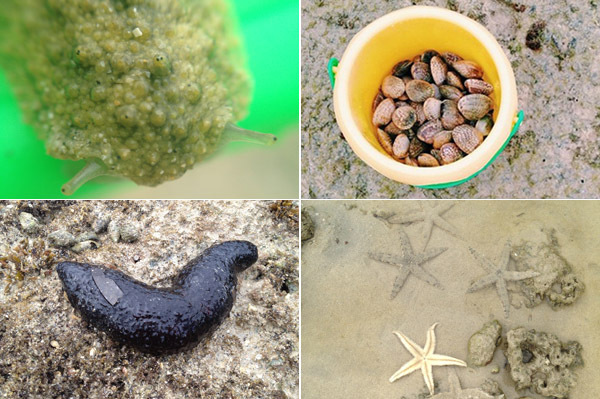 Hermit crabs are everywhere, and fun to catch, watch, and release. 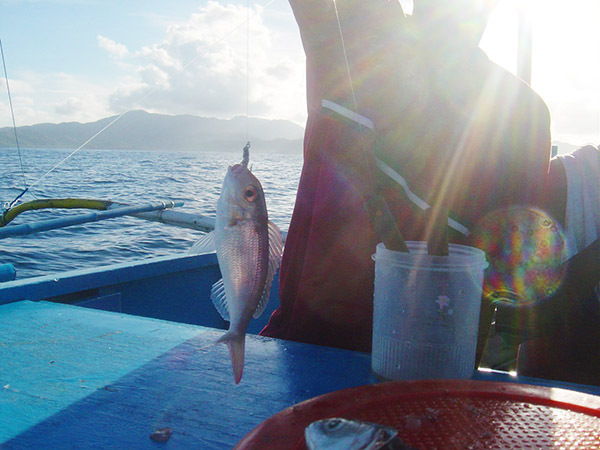 Locals are also incredible at catching small fish and octopus, and you can always find them fishing at low tide. 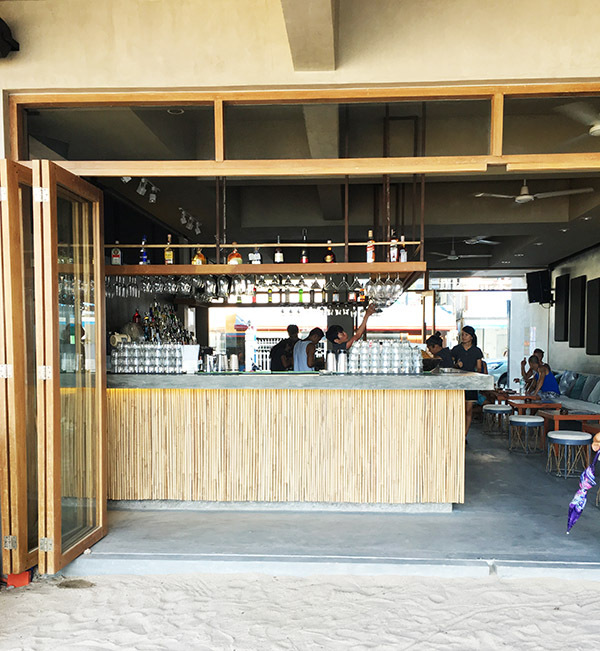 Grab dinner, drinks, and enjoy the beautiful sunset at La Plage in Corong Corong, which is best from November-March. 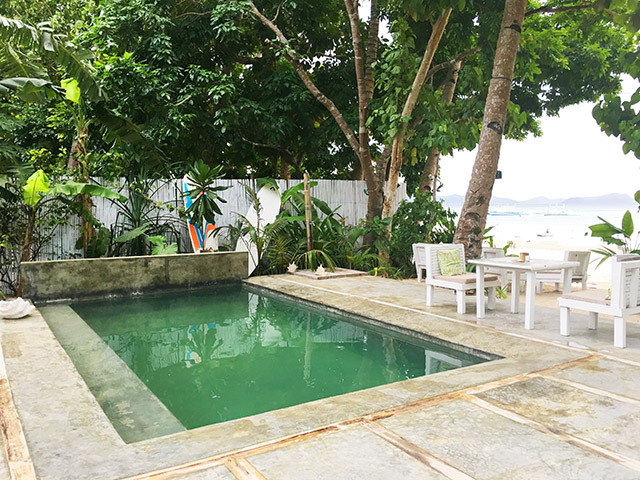 Kids can play in the water while you sit right on the beach, and there’s even a pool. 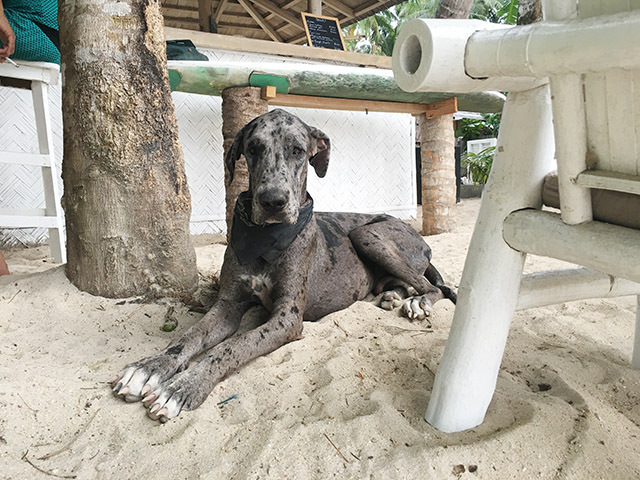 The gentle Great Dane the size of a small horse that lives there is sure to delight kids. 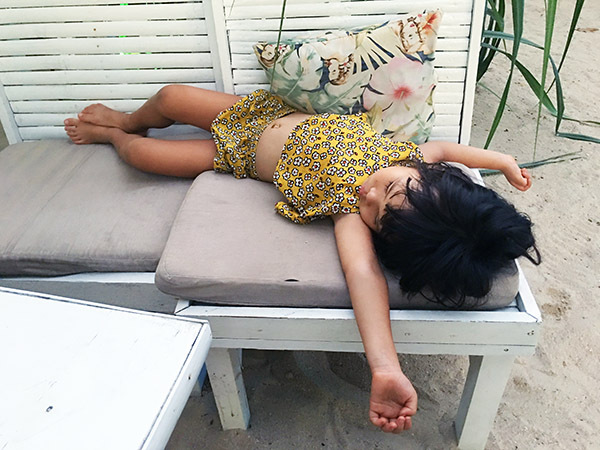 My daughter asleep at La Plage on a recent evening. Expect that young children will be lulled to sleep by tricycles and all the sun. 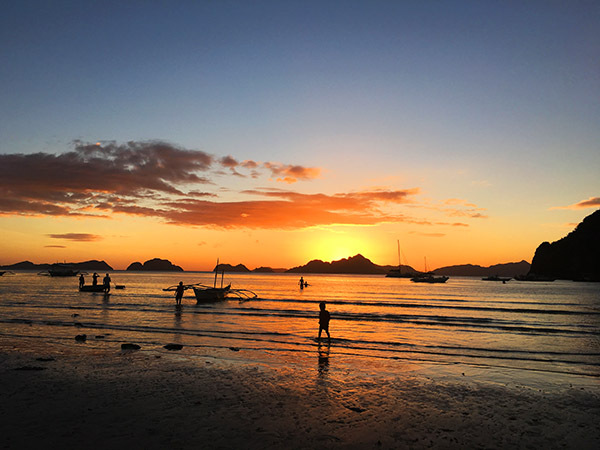 Las Cabanas has a wonderful, long beach for swimming, and it’s one of the best places to catch a sunset. 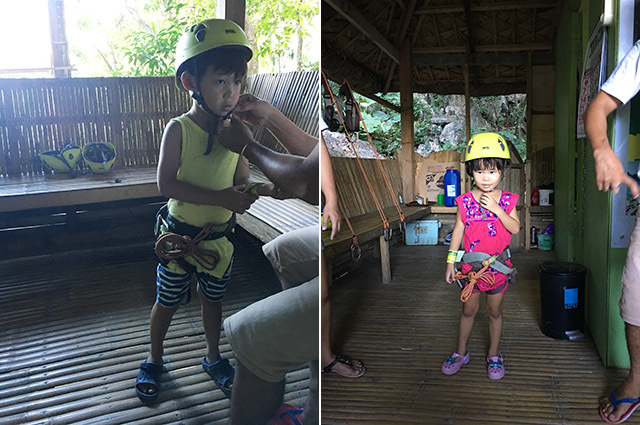 Older kids (8+ or so) can also zipline! You can walk up bridges and stairs to get a platform halfway up Taraw Cliff. My 4 and 6 year old were able to do it with a lot of help from the 2 awesome guides that accompanied us. It’s only 20 minutes to the top, so even young children can manage it. 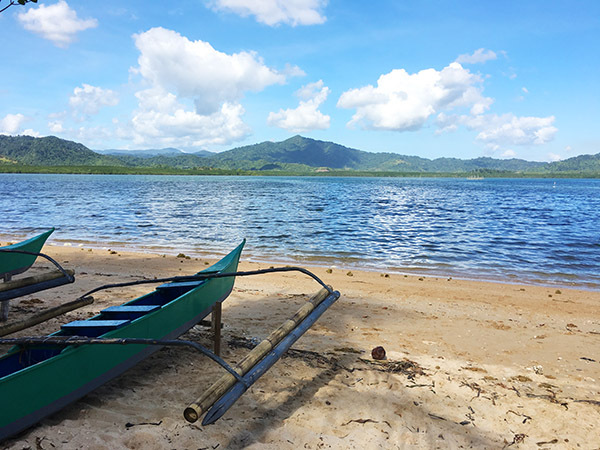 This all day tour includes shopping, hiking, fishing, cooking, weaving, crafting, climbing, dancing, playing games, all in an idyllic oceanfront setting. Please note that it does require a 30 minute walk each way, so you must either carry your young child or your child must be old enough to walk. It was tiring for our 4 and 6 year old, but they were able to do it and had a great time! All kids love pizza like my New Yorker kids, and this is the best pizza in town cooked in a wood burning oven. Ice cream, waffles, crepes, shakes, cheesecake, and much more. The best desserts in town! 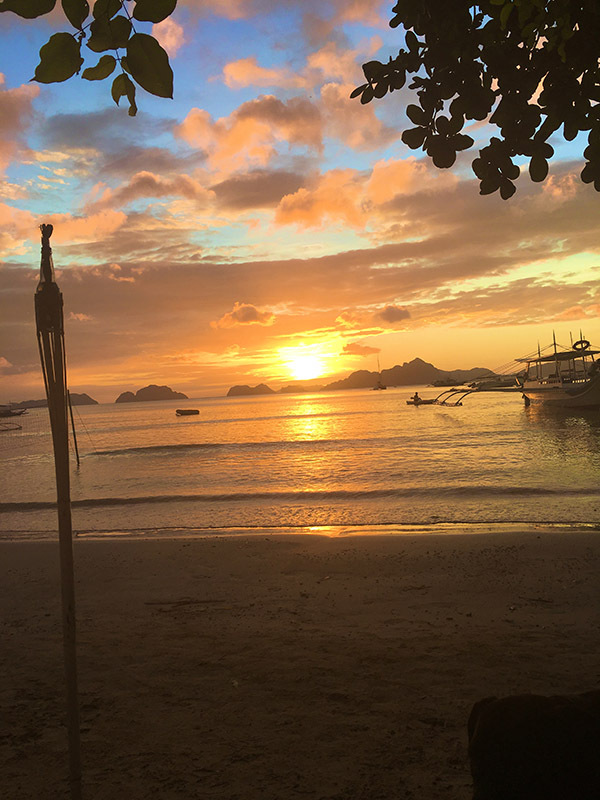 From May-October the sun sets at Caalan Beach, and Makulay is a great place to catch it. Since it’s located right by the shore, kids can play in the water while adults enjoy a meal and a refreshing glass of sangria! 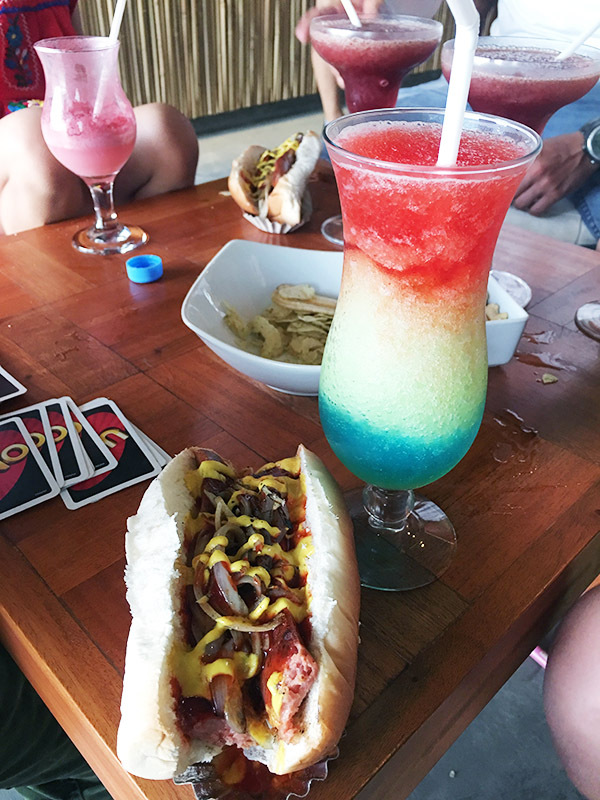 Enjoy a virgin strawberry, raspberry, mango, banana, or passionfruit daiquiri at El Nido’s newest beachfront bar. Adults can enjoy the best happy hour drinks in town from 4-6pm daily, while kids can play in the sand. 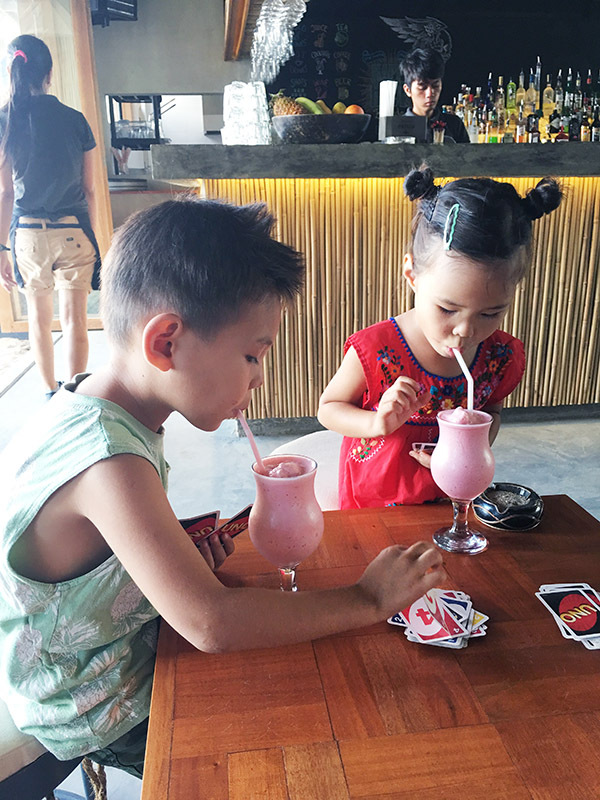 Pick up a deck of cards at Artcafe or Inggo and your kids will be entertained for hours! 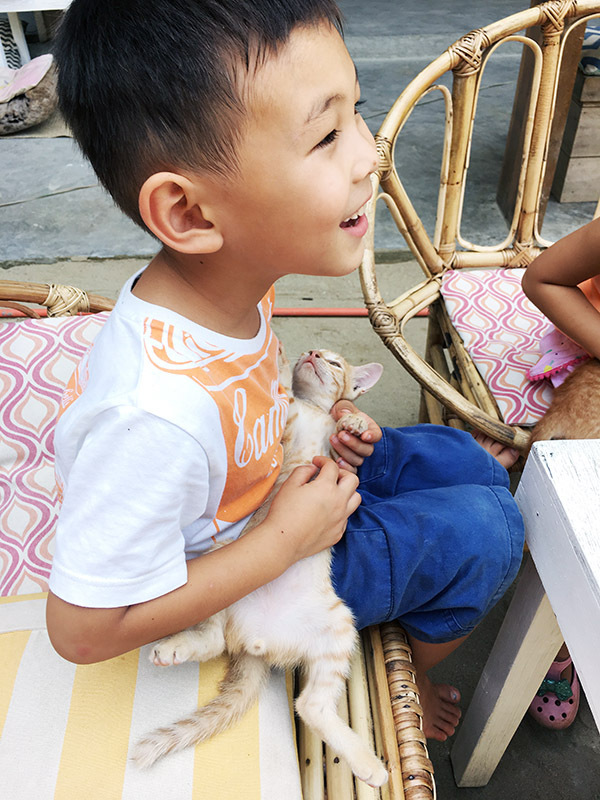 This is our other favorite local bar that has two kittens that our kids love to play with. You can get a foot spa here while you’re enjoying a delicious mojito! 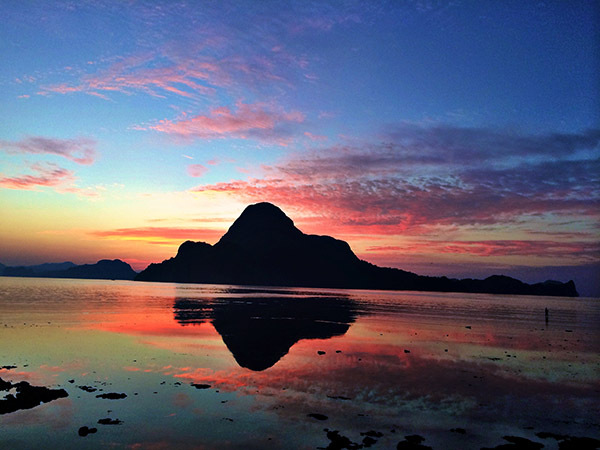 The Philippine Experience is unlike anything else available in El Nido. 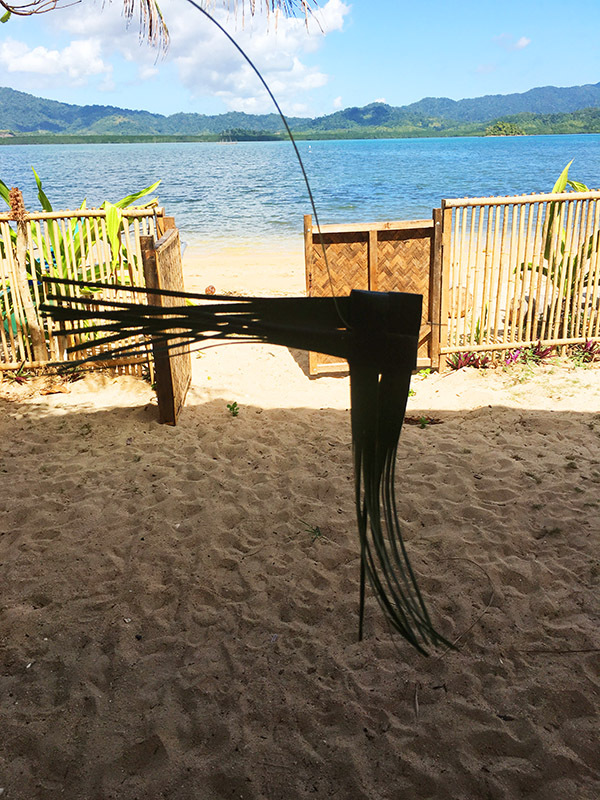 The all day tour includes shopping, hiking, fishing, cooking, weaving, crafting, climbing, dancing, playing games, all in an idyllic oceanfront setting. 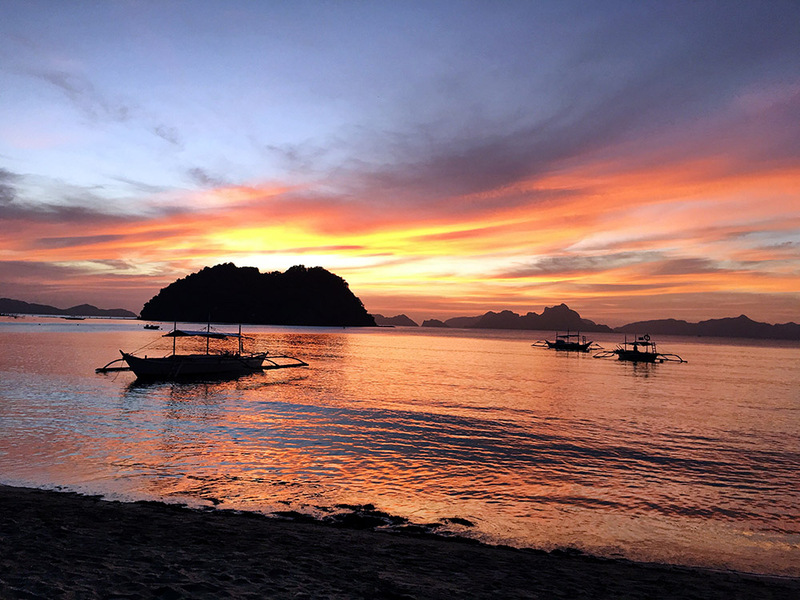 If you want to learn how the locals live, work, and play all while having an incredibly fun-filled day, The Philippine Experience is a must-do! The tour starts at the local wet market. Since we come here all the time as residents, we opted to watch this snake oil salesman while the rest of the group shopped. He certainly convinced the audience of snake oil’s properties as they were waving money at him trying to buy some! 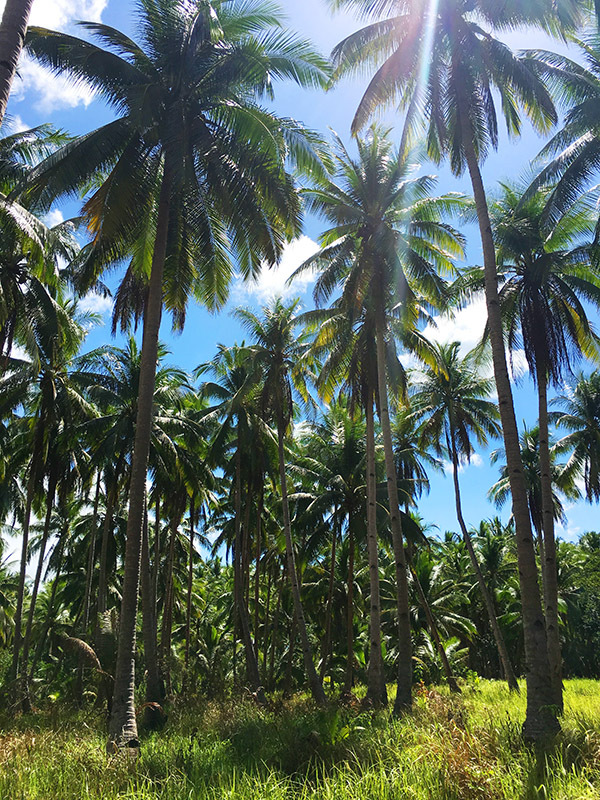 From there we went on an easy 30 minute hike through lush forests and mangroves where we learned about the local flora and fauna. 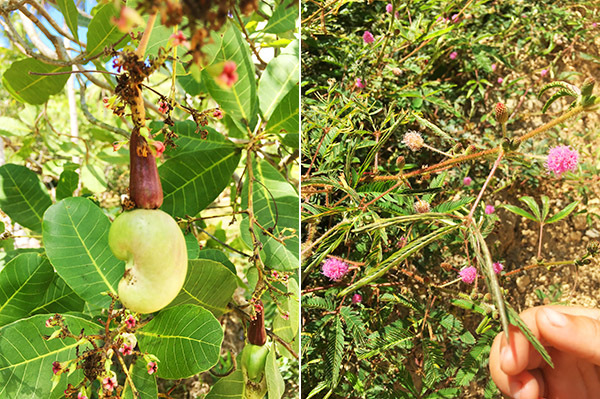 The plant pictured left is a cashew, one of the biggest crops in Palawan, and the plant on the right closes its leaves when you touch it. I’ve since discovered they grow all around my house! 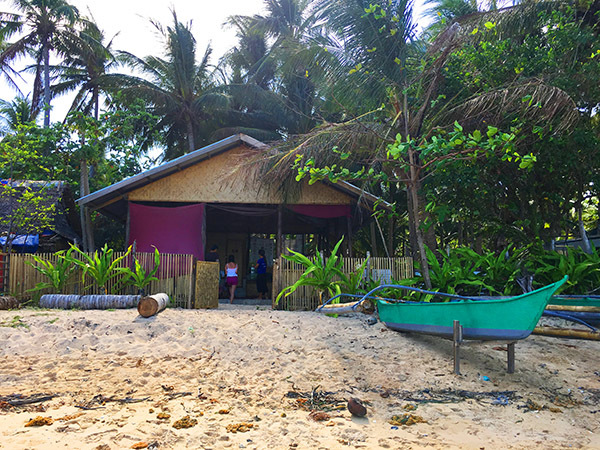 Once we got to their secret beach front location, we participated in a Philippines trivia contest (we were the only ex-pats and we lost! ), then got in canoes and went fishing for our lunch. 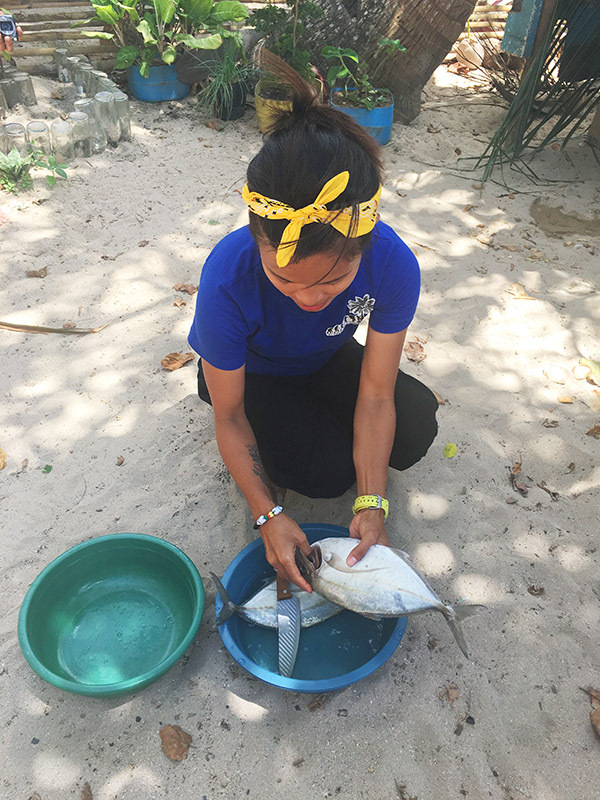 They taught us the proper way to gut and clean a fish. Many of the day’s events revolved around the incredibly versatile coconut that can be used in dozens of different ways! 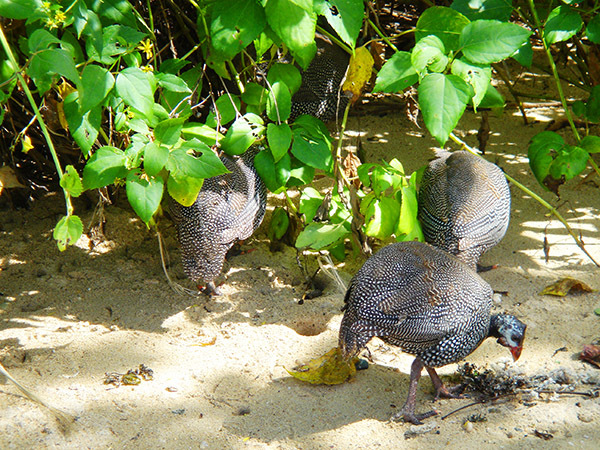 Our guides chopped coconuts in half with ease using a machete. Some of the coconuts had a baby coconut fruit inside which had a really interesting spongey texture to them and a very light, pleasant taste. 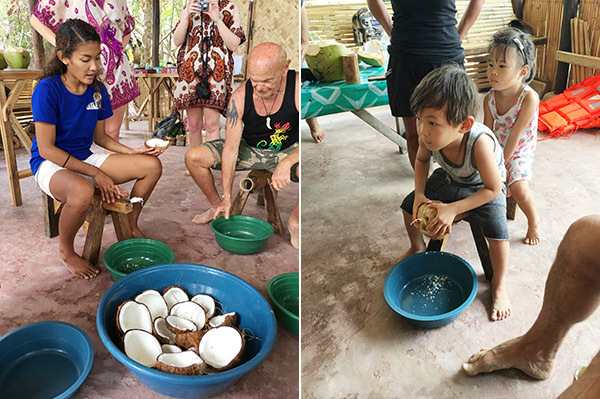 Then we used these special benches to shave off the inside of the coconut to make coconut oil. My kids loved this part of the day most! 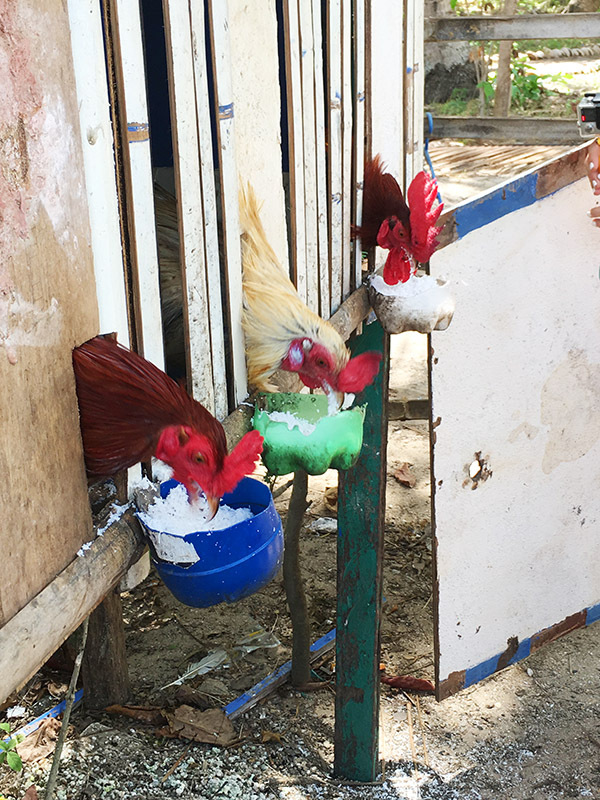 We took some of the coconut shavings and fed them to local chickens, pigs, and dogs. 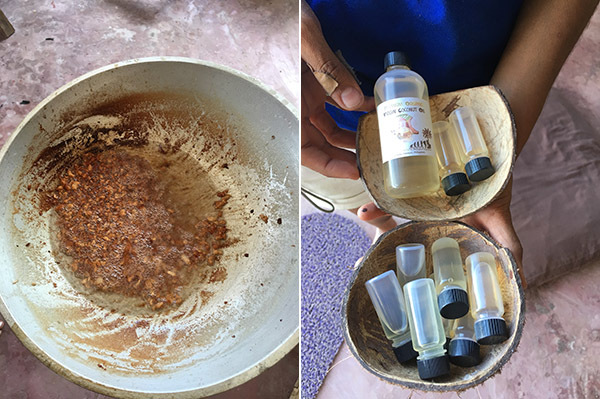 Then we boiled the coconut shavings until it separated into the most delicious smelling oil. My daughter said it smelled like cookies (macaroons!). 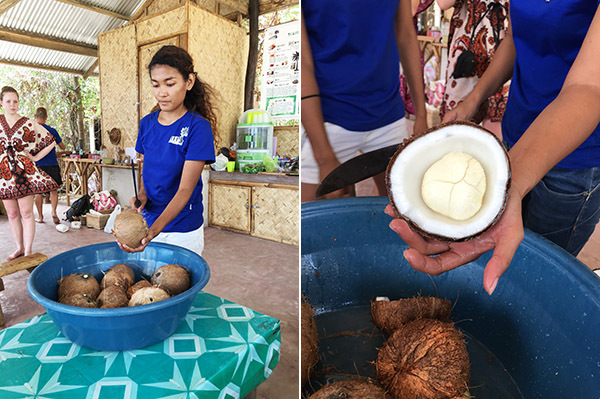 Each of us received a bottle of extra virgin coconut oil to take home, and we used the fried bits as toppings for halo halo at the end of the day! 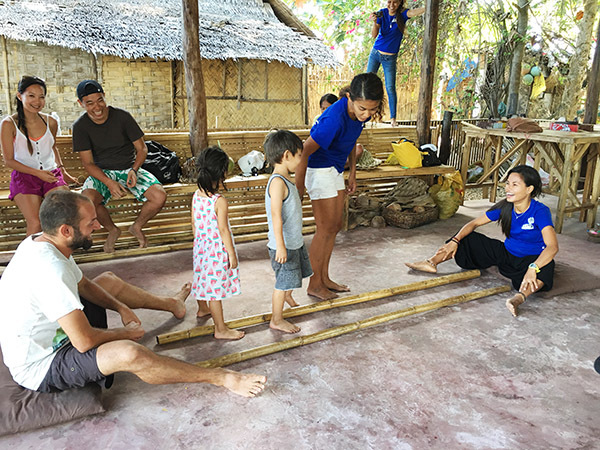 Next it was time for our traditional Filipino cooking lesson. We stoked our own fires with coconut shell charcoal and bamboo over these traditional local stoves made of an empty can of cooking oil and concrete. 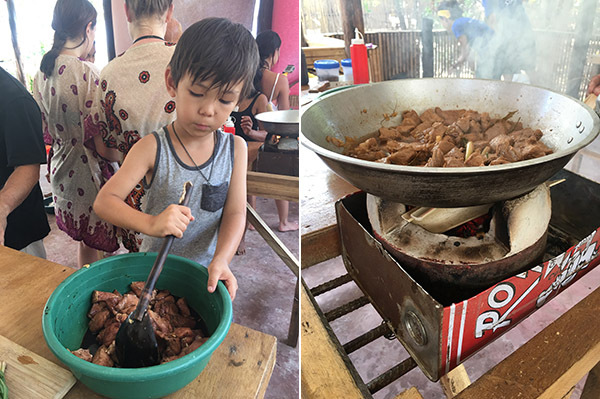 Then we cooked pork adobo with the ingredients they provided. There were three different tables, but one group undoubtedly had the most tender adobo (not our table!). My kids devoured the adobo. Lunch included several other dishes besides the adobo we cooked, and it was plentiful and delicious. I even stole one of the vegetarian munggo bean recipes and have made it to rave reviews! 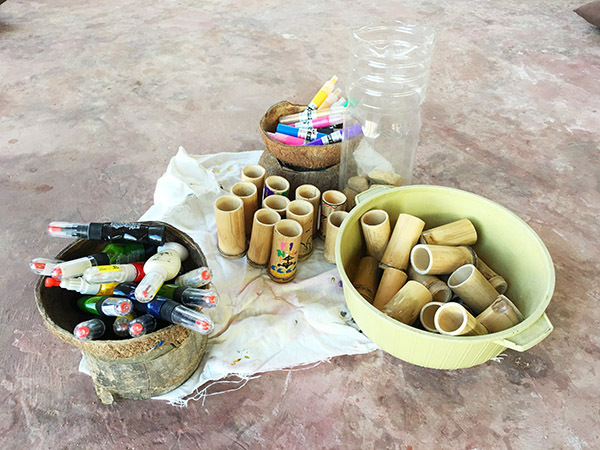 And decorating our own bamboo shotglasses. 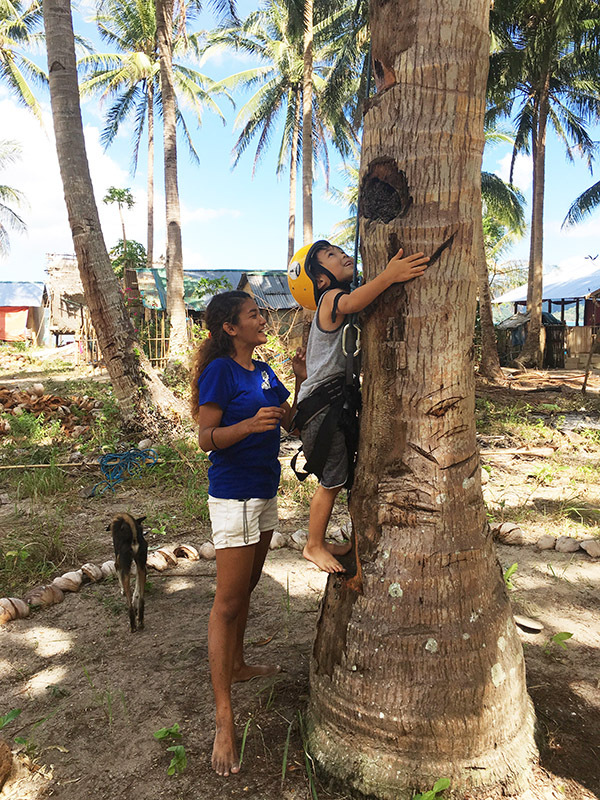 Coconut tree climbing for the brave! Towards the end of the day they taught us several traditional Filipino games and dances, which everyone of all ages really enjoyed. The staff is wonderfully warm, knowledgeable and enthusiastic and really added to an already excellent tour. Though the tour is best for older children (8+) because it involves a 30 minute hike each way, our 4 and 6 year old enjoyed the entire day (and they both promptly passed out in the tricycle on the way home!). There were so many other surprises throughout the day and I don’t want to give everything away, but I’m absolutely certain that you will love this unique tour. Read more rave reviews on Tripadvisor here!